Episode 11 features Anita Blom, who hails from Sweden, by way of Holland. I first met Anita two years ago. She attended a National Stuttering Association (NSA) conference, where she gave one of the keynote addresses. I remember feeling inspired by her active involvement in the world-wide stuttering community. I also remember that she came to the Open Mic session that I hosted on the last day of the conference. I spoke to her afterward, and felt instant connection. Since then, I have “run into” her at the on-line ISAD conferences. We now keep up through social media. I do hope I get to see Anita in person again sometime. It did feel completely right and comfortable chatting with each other via skype and webcam. Turns out, we both were wearing similar jams! Anita is busy! She has a large family, is an adult education teacher, does IT support, helps with the family company AND plays in a marching band. 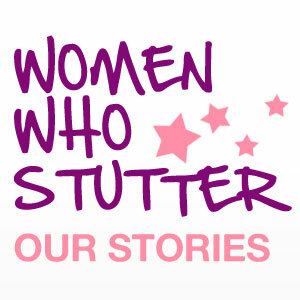 She also does a bit of volunteer work – she is Chair of her local stuttering chapter, Chair of the Swedish National Stuttering Association, is Vice Chair of the European League of Stuttering Associations and sits on several committees. It tired me out just typing this! Listen in on a great conversation, and feel free to leave comments for Anita (and me too!). Your feedback is always welcome, and helps me know that I am getting this right. Musical credit for “I’m Gonna Go” goes to Dano Songs. 10 Responses to "Proud Of Me, Finally – Episode 11"
Super contribution by Anita. It’s amazing to see how much she is doing for the stuttering community. I also love the idea that she eventually gets money for her stuttering activity, which is the one absolute revenge against all those bad omens we so often hear in our youth. Thanks a lot to Pam for allowing that interview which focused a bit on the work of people in Europe. In those times of NSA conventions (which can’t be praised enough), it’s also good for us living on the old continent to see we also have our own heroes!! Speaking of heroes, I would humbly recommend to Pam to seek inviting to the podcast the vice-mayor Anita is referring to in this installment. i had a good excuse to hear this particular episode. on the 2009 stuttering convention about the fear (of stuttering). And this episode was great also, and remind me a lot of my past ! My badge says: S-s-sure I s-s-stutter, what are you good at? Thank for you comments you all, and thanks Pam, for this amazing site! Love and admire you so much! I fixed it! Love and admire you too! We will meet up somewhere, maybe Argentina? I’d love to! We met for only a few moments and we have so much to talk and laugh about! This is a great episode ,thanks Anita ,perhaps I need to take a leaf from your book and start educating the kids and adults I work with .. This is very well worth listening to for plenty of reasons. I thought that Anita’s story was amazing and inspirational. I admire her strength to come to where she has from where she once was. She seems to have come full circle.. hearing that she got her current job because she stutters made me just stop, go blank, and then think. Awesome! She has come to live with this “abnormality” with grace and poise.